Ener-C was designed with you in mind. This delightful-tasting, effervescent vitamin drink mix is full of natural goodness. Pick up a box of Ener-C`s Variety Pack and get 10 packets each of lemon lime, tangerine grapefruit, and raspberry. All vitamin and mineral sources have been chosen not only for their quality, but also for their ability to absorb easily in the body, ensuring that you get the greatest benefit from each and every packet of Ener-C. Taste: We know that each one of you is unique and have different things that turn you on and off. One thing we do know is that most, if not all, of you like the taste of fruit. That’s why we have launched Ener-C with four unique and deliciously effervescent, all-natural fruit flavours. 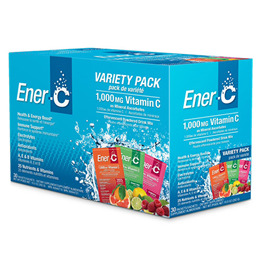 So make sure you try our Orange, Raspberry, Lemon Lime, and Tangerine-Grapefruit flavours and know that each time you drink a tasty Ener-C, you’re getting the benefits of consuming real fruits along with your vitamins and minerals. Tangerine grapefruit: Fructose, citric acid, natural tangerine flavor, sodium bicarbonate, tapioca maltodextrin, beta carotene, purple sweet potato powder, malic acid, silicon dioxide, tartaric acid, natural grapefruit flavor, natural orange flavor, cysteine hcl, glycine, stevia. Lemon Lime: Fructose, Citric Acid, Malic Acid, Sodium Bicarbonate, natural Lemon Lime flavour, natural Lime Flavour, Tapioca Maltodextrin, Silicon Dioxide, Glycine, Aspartic Acid, Quercetin Dihydrate powder, Tartaric Acid, Cysteine HCl, Lemon pulp powder. Raspberry: Fructose, Citric acid, Malic acid, Sodium bicarbonate, Natural Raspberry flavor, Tapioca maltodextrin, Silicon dioxide, Glycine, Aspartic acid, Tartaric acid, Cysteine HCl, Purple sweet potato, Caramel colour, Beet juice powder. Below are reviews of Variety Pack Vitamin C Drink - 30 Sachets by bodykind customers. If you have tried this product we'd love to hear what you think so please leave a review.